The Super Bowl is over and it’s one for the history books as they say what with Denver getting their butts kicked. Poor Denver but what is…is…and even more pathetic than this one-sided game was Bill O’Reilly’s pre-game interview of the self-anointed king of us all…Barack HUSSEIN Obama. The interview…which focused on the disastrous ObamaCare roll out, the Benghazi fiasco, and the IRS’s targeting conservative groups applying for 501-C3 status…had O’Reilly trading for-the-camera barbs with Obama like they were good buddies. 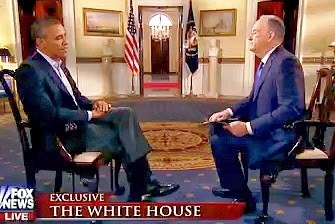 And while at times O’Reilly did seem a bit annoyed with Obama when he asked him certain questions he knew Obama did NOT want even brought up (as in Benghazi), he still let Obama slink out of answering them directly…accepting vague alludings instead of demanding simple YES or NO answers to those questions. 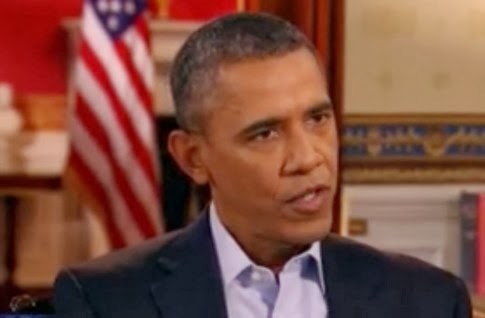 Evasive rhetoric with NO substance…the hallmark of Obama and his entire administration. But sadly, O’Reilly showed his true colors when in a phone interview on ‘FOX and Friends’ yesterday morning he said, “I don’t think he (Obama) wants to hurt anyone but his policies are hurting people.” Give me a freakin’ break…how about the five million plus people he knew beforehand he would hurt with his out and out LIE about being able to keep their health insurance…how about the multitude of seriously ill people who have now been cut off from the very doctors treating them…how about the countless handicapped children and adults now without the services they require…these are living, breathing, flesh and blood people hurt NOT by policies per se, but hurt by a miserable excuse of a president who did NOT and still does NOT care one damn iota about them even knowing they would be hurt. And O’Reilly backed away from this very critical point both in the Obama interview and in his musings yesterday morning. 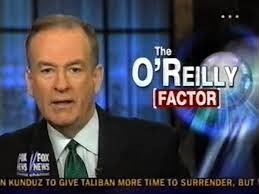 And so O’Reilly bloviated (one of his favorite ‘Words of the Day’) on to ‘FOX and Friends’ that his being tough on Obama…especially with his Benghazi questions… with tough being a happening in his mind alone…would be fodder for the liberal press as they would say he was a shill for the GOP because all he did was ask GOP questions. And while some questions O’Reilly did ask were indeed ones asked by Republicans during the Benghazi hearings…the problem is he let Obama off the hook time and again by NOT pounding home…or even mentioning for that matter…that Obama deliberately and with malice left four Americans to die nor did he touch upon the true reason why the attack happened…as in Obama’s ILLEGAL gun and weapons running operation to the al-Qaeda backed Syrian rebels…done through Benghazi…went sour. NOT a word about that on ‘FOX and Friends’…NOT a word during the Obama interview either. “Your detractors believe that you did not tell the world it was a terror attack because your campaign didn’t want that out,” O’Reilly said. “That’s what they believe.” And Obama’s retort was to blame FOX with his statement that, “They believe it because folks like you are telling them that” and throwing in for good measure, “These kinds of things keep on surfacing, because folks like you will promote them,” he said in reference to the IRS scandal. 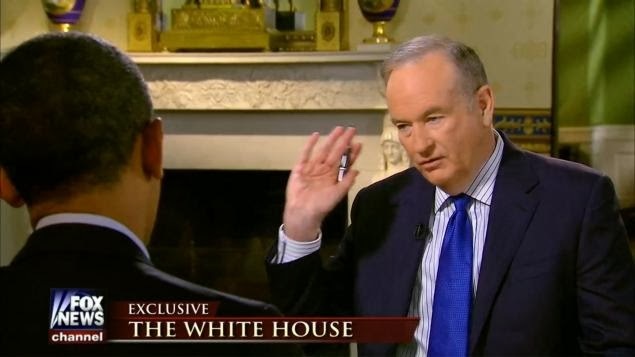 “Folks like you”…subtle racist words out of a NOT so subtle racist’s mouth…and you have NO idea how I wanted to give O’Reilly a slap upside his head for he let Obama take control of the interview with those two sentences. Continuing on to say that Fox News is to blame for “misinforming” the public on issues that have stalked his presidency during the past year, Obama thought he had sweep the matter of Benghazi under the rug…for now at least…but oh how wrong he is. And I hate to tell Obama…NO…actually I love to tell Obama…but FOX News was the ONLY news channel that reported the truth about his traitorous Benghazi actions…his ObamaCare roll out nightmare…and his IRS scandal that keeps growing in scope, albeit at times a watered down version of that truth, but hey, watered down is better than what the alphabet media gave us…as in NOT a damn thing at all. And when O’Reilly zeroed in and asked Obama why Kathleen Sebelius had NOT been fired for the major part she played in the ObamaCare nightmare roll out, he again went the kumbaya route saying, “I’m sure that the intent is noble but I’m a taxpayer, and I’m paying Kathleen Sebelius’ salary, and she screwed up. And you’re not holding her accountable.” Nobel my eye for she and Obama knew months before the roll out that the Healthcare.gov website was but minimally operational at best and bold-faced LIED…yet again…to the American people that all was well. “Well, I promise you that we hold everybody up and down the line accountable,” Obama answered…NO…Obama LIED again for NOT one single person has been held accountable for anything…NOT one. And when asked if Obama thought the, “If you like your plan you can keep your plan” comment (O’Reilly should have called it what it was…an out-and out LIE) was his “biggest mistake,” Obama skirted this question by saying that the implementation of the Affordable Care Act…he now NO longer calls it ObamaCare as if we don’t know why…was an ongoing process, and he was committed to getting it to work rather than dwelling on past mistakes. “I try to focus not on the fumbles but on the next play,” Obama said. And here O’Reilly should have tossed Obama’s ridiculous football reference aside as ObamaCare is beyond mere fumbles, and gone for the jugular for with ObamaCare there is much to rip apart…but Mr. Fair and Balanced didn’t. Hannity would have…you can bet on that. But really, in an interview of this sort when all is said and done the point remains that it’s NOT what O’Reilly said but what he didn’t say for here he had a chance to nail Obama to the wall with tough, insightful, demanding of answers questions, but instead he chose to go the soft way with beaten to death regurgitation of the same old tired questions that we’ve NOT only heard before but questions that actually allowed Obama to deflect them…as he’s done so many times that he can do it even without his trusty teleprompter prompting him. And while I know that 10 or so minutes do NOT an in-depth interview make…and maybe if Bill O’Reilly had more time he would have insisted on more direct answers…you still know that O’Reilly will hawk this interview ad-nauseum on his show for weeks, and Obama gets to continue to take digs at FOX News… something he loves to do every chance he gets.